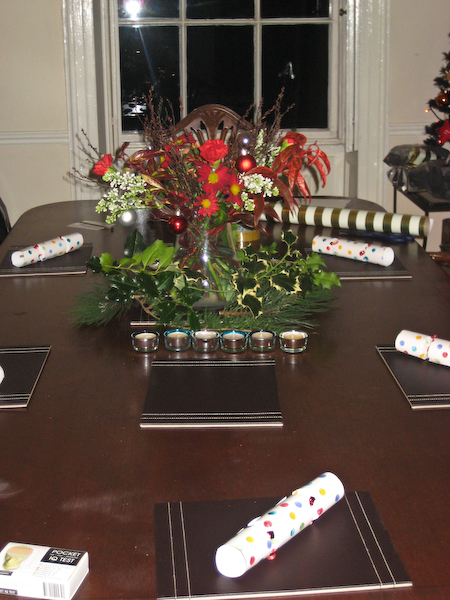 I have decorated the table for Xmas dinner already.That would be 24 hours in advance. I am proper organised now. We have polka dotty crackers and lots of candles. And I raided the park for holly and fir and have surrounded the flowers with them. The entire flat looks very festive and smells lovely to due my L’Occitane cinnamon candle that I splashed out on. It was well worth the money and smells beautiful. I might be feeling a little festive now. I bet I’ll feel even more festive after I open the Barbera. 24 December 2010 in Uncategorized.